Maybe it should be the Black Sage Benches. As a glacier retreated north through the Okanagan Valley approximately 10,000 years ago, a large piece of ice was left behind at what is now Vaseux Lake. 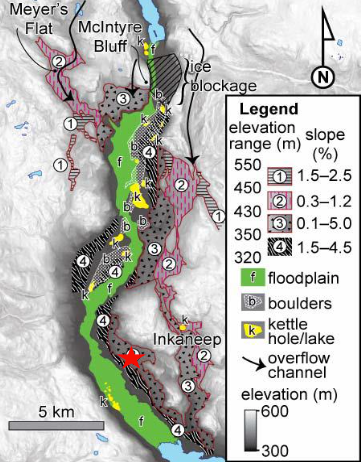 This, combined with till and sediment, created a dam that resulted in the formation of a natural reservoir, which would later become Skaha and Okanagan Lakes. Streams emanating from the dam filled the south Okanagan with sand and gravel deposits (or outwash) over several hundred years. As a result, the valley floor was much higher than it is today at 550m above sea level. However, ice is not an ideal material for a dam. 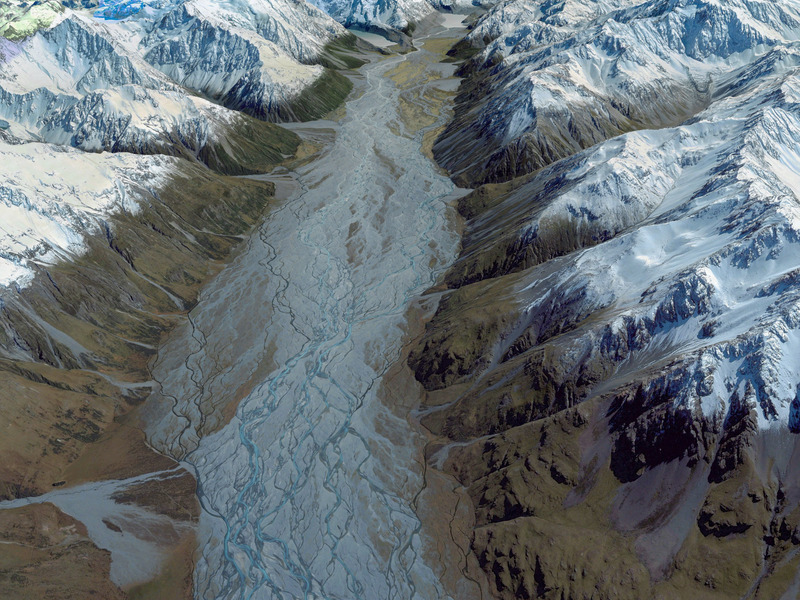 At least four catastrophic failures occurred, resulting in violent flooding that eroded and cut into the existing deposits. This created four distinct terraces on both sides of the valley, and dramatically lowered the valley floor to 275m. With each flood a new, lower terrace was formed. The star marks the approximate location of Phantom Creek. Source: Toews, M.W. and Allen, D.M., 2007, Aquifer Characterization, Recharge Modeling and Groundwater Flow Modeling for Well Capture Zone Analysis in the Oliver Area of the Southern Okanagan, BC, page 27. Today, the Black Sage Bench encompasses two of these terraces. The upper terrace (350-430m elevation) is the third carved by flooding. An outcrop of bedrock sheltered this terrace from further erosion, which explains why it has remained relatively wide. The lower terrace (320-350m elevation) is the fourth and last, and is much narrower in comparison. The upper terrace, roughly to the east of Black Sage Road, is slightly more moderate with greater sun exposure. In comparison, the lower terrace is closer to the hot valley floor, and produces wines with more weight and intensity. Wines from both terraces are characterized by the distinctive aromatic flora of the area such as desert sage. Phantom Creek and Sundial Vineyards on the Black Sage Bench. In our case, Phantom Creek Vineyard is located above the valley floor on the lower terrace of the Black Sage Bench. Sundial Vineyard is largely on the upper terrace, closer to the Okanagan Highland foothills. 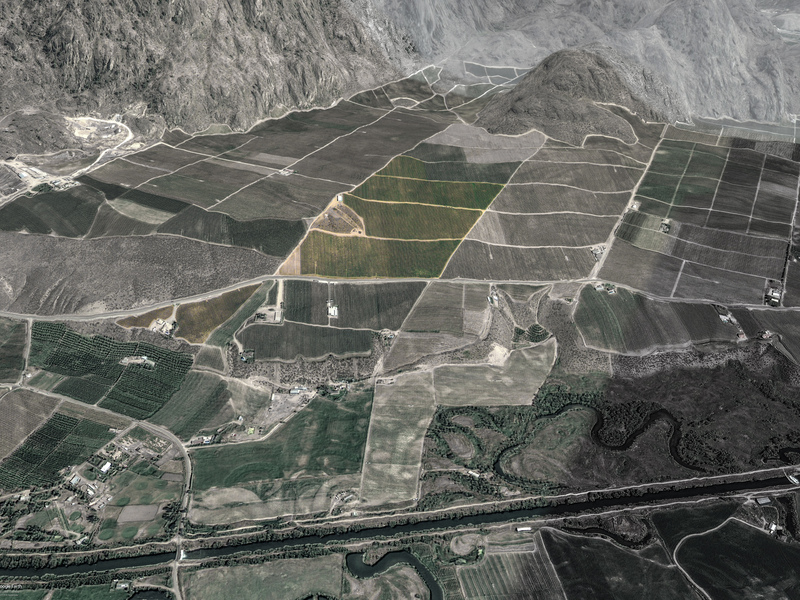 The two vineyards are separated by just over 100 metres, but the resulting wines could not be more different. Thanks to Audrey Perry for her work in researching the geological history of the Black Sage Bench and Phantom Creek Estates. This article draws heavily from her report.